I used to think Elton John was SO lame. When I was a kid I would hear the same Elton John songs every day during my bus rides to and from school, and it was brutal. Mixed in with a rotation that had Sophie B Hawkins and Air Supply at the top and bottom of every hour (or at least it seemed that way) Elton John’s songs from the Lion King soundtrack and his hit “Believe” were inescapeable. It was like some kind of sick torture for my ears, as if junior high wasn’t punishment enough. It wasn’t until a few years later that I found a copy of Goodbye Yellow Brick Road mixed into my dad’s CD collection that I started digging on Elton. I was shocked by how good the songs were, how NOT “Crocodile Rock” he could be. The first time I heard the opening of “Funeral For A Friend/Love Lies Bleeding” it was like the whole world was crumbling around me. Everything I thought about music had to be re-evaluated. It took me a while to make my way through the back catalogue of Elton John, but holy cow was it worth it. 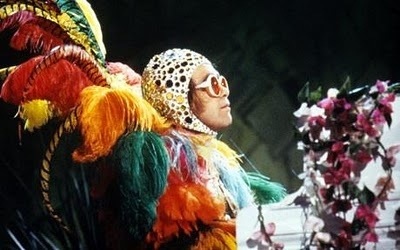 I’m not sure if there is already an Elton John Day, but there should be. I’m declaring it, right now, today. For no other reason than he deserves it. Far too often he’s left out of the conversation, and it’s a major diss to his talent. So, here’s my top 10 spanning his whole career, with a deep emphasis on the early 70’s. I’m as amazed as you are that “Honky Cat” didn’t make the cut.